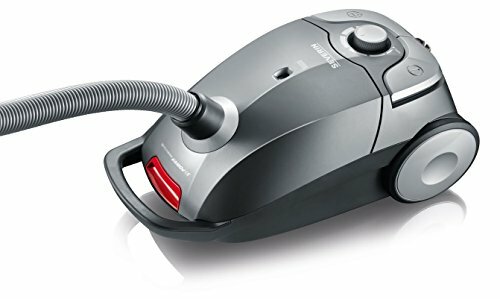 GERMAN ENGINEERED HIGH QUALITY HOME APPLIANCE: Severin's Vacuum Cleaner is among the best in the world and is one of the most innovative brands available today. EASY TO CLEAN AND READY TO USE: This floor vacuum cleaner cleans hard-floors and carpets. It's easy to handle, quick to use and has a versatile range of functions . FUNCTIONAL TOOLS: Severin's Vacuum Cleaner has a switchable Premium-Eco floor nozzle with rollers, an additional extra large parquet nozzle and an Ergo-Soft extra large handle with click connector. ACCESSORIES TO CLEAN ANY CREVICE: Includes a 3-part accessory set; upholstery, furniture, and crevice nozzle. Also features a long extra large easy touch telescopic tube and an extra large Premium suction hose. INNOVATIVE AND PREMIUM FILTRATION SYSTEM: Each product has a motor protection filter made of hygienic fleece and includes 2 microfiber dust bags with hygiene lock. HIGHEST QUALITY WITH TREND AND TRADITION! Severin has been manufacturing electronic household appliances for over 60 years, with the aim of making daily life as easy as possible. German quality standards in conjunction with simple operation are the hallmarks of our claim. Our headquarters are located in Sundern, a city in North Rhine-Westphalia, Germany.